Yesterday our portfolio company Tumblr announced that they had quietly done a round of financing with the existing investors. And they also announced that the Tumblr service is serving over 1bn pageviews per month. I thought it might be useful to put 1bn pageviews in perspective. I went into comScore and looked at how many web properties serve over a billion pageviews worldwide each month. The number is 57. Here are the comScore stats on that. Monthly pageviews are the farthest column on the right. Now, it is important to state that we are comparing apples to oranges here. 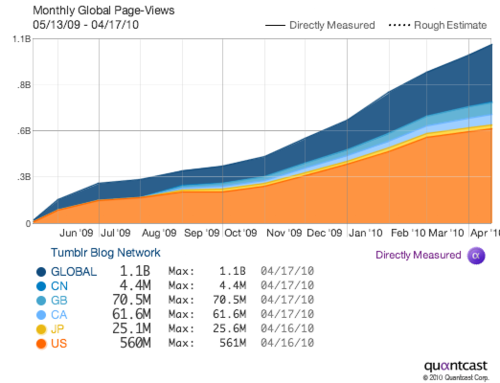 Tumblr is not measured directly by comScore. The data in that first chart comes from Quantcast. And comScore does not roll up all the Tumblr pages that run on other domains. Quantcast does that. If comScore did roll up all of Tumblr and if it measured Tumblr directly, it might not report 1bn pageviews per month. Or it might. But that's sort of beside the point. 1bn pageviews is a seriously big number. Only 57 properties in the world report that kind of number on comScore. And Tumblr got there on $5mm of invested capital (we just put in another $5mm). There are several reasons why they were able to do that. First David and Marco are an amazing team. They did all of the work themselves for the first year. And now they have a small team who maintain the service and develop new features. They get a lot done with very little. And finally the service is amazing. The Gotham Gal started a tumblog this past weekend. She has blogged for almost seven years so she is no novice to this kind of software. She got her tumblog up in about five minutes and posted a bunch of stuff. And then she turned to me and said "wow, this is so easy." There are some lessons here. First, make your software super easy to use. Second, you don't need hundreds of employees to build a big time web service. You can keep it lean and scale if you have the right team. That's how Tumblr got to a billion page views and we just made a bet that they will be able to take that number a lot higher.